If you're thinking about how to solve a particularly stubborn heating problem but don't have a lot of space to devote to the solution, the Empire DV210SG Direct Vent Gas Wall Furnace - Natural Gas is the perfect product. With this wall furnace you get permanent relief from the winter blues without having a bulky or unsightly heater sitting around in your room. Empire wall furnaces offer the highest-quality craftsmanship combined with superior function. The easy through-wall vent included with the wall furnace means you won't need a chimney to vent the exhaust. With a variety of sizes available, you can easily find an Empire wall furnace to fit your space's needs. This model requires no electricity for operation. Best of all, the automatic shutoff makes the furnace safe for your family and your home. Sometimes no space is no problem. You don't have to be uncomfortable in part of your own home just because your current heating system doesn't completely do the job it's supposed to. The Empire DV210SG Direct Vent Gas Wall Furnace - Natural Gas is an incredibly efficient and permanent answer to even the most head-scratching heating questions. How Much Firewood Do I Need For Winter? Does the unit have to be mounted on an outside wall? Yes, this unit does have to be mounted on an outside wall. How many sq ft can this heat? 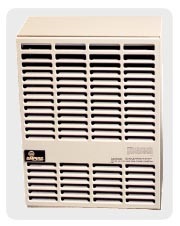 This direct vent wall furnace will heat approximately 285 square feet. Is this unit child safe, not hot to the touch? Unfortunately, no. The manufacturer states that this unit will get quite hot and to avoid contact or close proximity to avoid burns or clothing ignition. Does this actually stick out 9 inches off the wall? Yes, this unit is indeed 9 3/8" deep. You can see the official spec sheet at the bottom of page 6 in the owner's manual. If you can hook up a stove or dryer you can hook up this furnace. Very easy to setup and operate. Very happy with purchase. There is a lot of smoke when if first fires up so be aware that it is normal. If you read the instructions and manual it will state this. We have heated a about 800 sq ft two story home in Akaska for more than twenty years with the above heater. I could not be happier with it. We have replaced ONE thurma couple in all the years with NO other problems. No worries about heat durning power outages. It is number 1 on my list of best buys ever. You can not go wrong with an empire gas stove. Not the most efficient, but makes up for it by a simple install. My mother has a small rental cabin on her property and we needed a new heat source for it. We were somewhat desperate due to being in the middle of a cold snap. fireplace, but the unit and installation would have cost us $3800.00. Kinda steep for a little cabin Which only provides a modest income . We looked into gas wall furnaces, and found the efireplacestore.com. The salesman we talked to was VERY knowledgeable about MANY types of heating sources. He really helped us find just the right size, type to suit our needs. We were able to get a natural gas console wall heater perfectly suited for the cabin at a much lower cost! ProsGood quality for the cost. Can be used as a heat source WITHOUT ELECTRICITY! Easy to operate. Easily heats the whole cabin. ConsNothing against this unit. Possibly only that a fireplace with visible fire would we more visibly attractive. Heats required amount of space to be needed (800 sq ft). Pezo & gas control valve hard to access if unit is mounted low such as 8" from floor. ConsNone I can think of. This heater is a good choice for heating a Small room or cabin. It takes no electricity and uses outside air. I'm using it to heat a patrol cabin in the hills near mt. Rainier. Slight dent in front, but most likely a shipping issue.. I installed this unit in a 77-year-old cabin high in the Santa Cruz mountains. After using it for nearly ten years, it still does a great job of producing heat. It has developed a bang when it starts and stops, but it may be a problem with the heat chamber, which is covered by a ten year warranty. When the first snow of the season came, I had just installed my Empire DV 35. What a joy to enjoy its warm heat in my Sierra mountain cabin while I watched the snowfall out my large window. That experience to me is the definition of Empire Happiness. Because of the position of the blower, the heat cause the top of the unit to get very hot. It would be better if the blower were on the top part of the unit and directed the heat down toward the bottom. This unit was purchased for a rental property. Since it was installed very recently, I am unsure how it will affect the gas bill as of yet. I believe, however, that the thermostat is defective since the heater will not cycle on and off. This quiet, efficient heater warms my 250 square foot cabin with no problem. The safe direct vent exhaust gives me peace of mind. I used this heater for five years without any problems and was very happy with it. Last year, I had to replace the thermocoupler. Now, at the start of another winter, it appears that the thermocoupler is again broken. Unfortunately, it is not a cheap part since the unit uses the more expensive wired coupler instead of the tube version. Our little heater, though not very attractive, keeps us from having to burn fuel in our vacation cabin. It keeps the pipes from freezing at 45 degrees on low, which is a better track record than other heaters which keep pipes from freezing at 60 degrees. We can use ours to dry wet clothes by placing them in front of the blower. Our children enjoy curling up underneath the heater to sleep.